Chicken, chicken meal, peas, lentils, pea flour, sweet potatoes, fava beans, chicken fat (preserved with mixed tocopherols), tomato pomace, egg product, natural flavor, flaxseed, dicalcium phosphate, salmon oil (source of DHA), salt, DL-methionine, choline chloride, taurine, dried chicory root, dried Lactobacillus plantarum fermentation product, dried Bacillus subtilis fermentation product, dried Lactobacillus acidophilus fermentation product, dried Enterococcus faecium fermentation product, dried Bifidobacterium animalis fermentation product, vitamin E supplement, iron proteinate, zinc proteinate, copper proteinate, ferrous sulfate, zinc sulfate, copper sulfate, potassium iodide, thiamine mononitrate (vitamin B1), manganese proteinate, manganous oxide, ascorbic acid, vitamin A supplement, biotin, niacin, calcium pantothenate, manganese sulfate, sodium selenite, pyridoxine hydrochloride (vitamin B6), vitamin B12 supplement, riboflavin (vitamin B2), vitamin D3 supplement, folic acid. 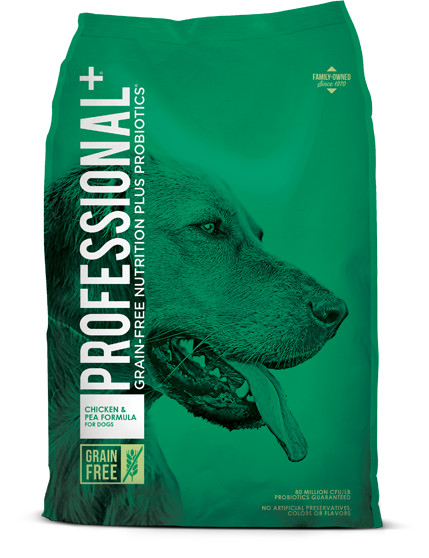 Professional+ Chicken & Pea Formula for Dogs is formulated to meet the nutritional levels established by the AAFCO Dog Food Nutrient Profiles for All Life Stages including growth of large size dogs (70 lbs. or more as an adult).